With the return of high summer and the longest days of the year, my mind drifts back to an incredible mountaintop experience I had just a week shy of the solstice some years ago. The azaleas on Gregory Bald are breathtaking to witness in full bloom. 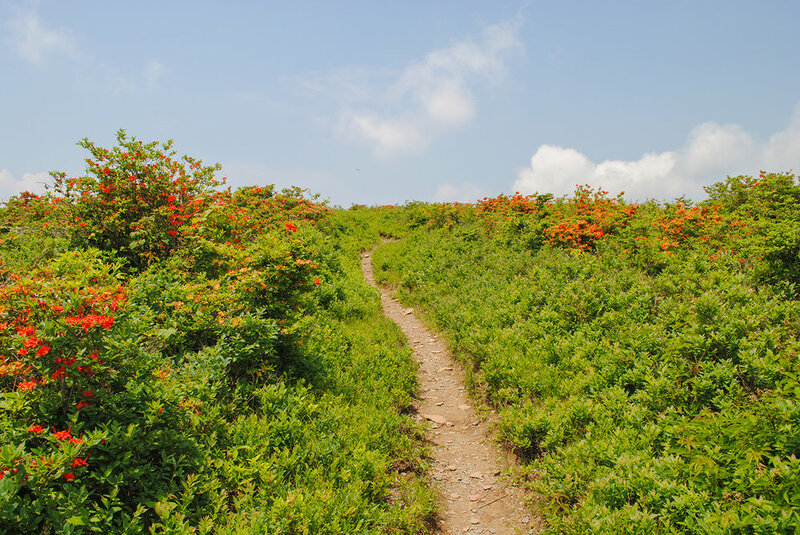 Gregory Bald was this magical place that I heard about in graduate school, an Appalachian peak covered with azaleas that lights up in mid-June like an orange St. Elmo’s fire of Rhododendron cumberlandense (Cumberland azalea). I had been cooped up for six months with a torn tendon in my right foot, and at night I would scour the internet looking to experience the wild beyond my bleak apartment walls. The quote still burned into my brain seven years later from reading Hiking in the Smokies was, “This [hike] should be on the life list of any self-respecting hiker, gardener, or nature lover.” I knew before I moved from Raleigh I had to experience this natural treasure. But, when and how? One day, that opportunity presented itself. Sitting in the graduate office with my foot fully healed, I struck up a conversation with my friend Irene Palmer who casually mentioned that she and Tom Ranney’s crew were hiking up to Gregory Bald. They were blooming early due to 2011 being a warmer than normal year. I was ecstatic. For them at least. She invited me to join, but I had errands and prep for an upcoming conference that were to fill the rest of my week and weekend. But, then the calendar in my head started moving the to-do’s around, and I realized that I actually had a free weekend if I could get the bulk done before their excursion. Friday after work, I drove to Asheville to spend the night. The next morning, we headed toward the Great Smoky Mountains National Park, one of my absolute favorite places in the world as blog readers will likely recognize. Traveling with me was Tom Ranney, esteemed plant breeder at North Carolina State University; his wife, Amira; Kevin Parris, horticulture instructor and arboretum director at Spartanburg Community College; and Tom's student crew and my good friends Jason Lattier, Kelly Oates, the previously mentioned Irene, and Kim Shearer. The main purpose of the trip was to assess the Gregory Bald azaleas for Kim’s summer internship project focusing on better understanding their genetics. We stopped at Chimney Tops on Saturday to do a little pre-hike to see what botanical interests we could find. Climbing the steep crag made me feel like I was following my father’s footsteps. Dad would often share with us on family trips through the Smokies that when he was a youngster he had hiked Chimney Tops. Now, I was, too. Looking down from Chimney Tops. The Ericaceous Kalmia (mountain laurel) on the right are hints of other blooming plants to come. After summiting and returning to the trailhead, we travelled toward Cades Cove. Traffic was heavy in spots as many tourists congregated to see the synchronized fireflies in the Smokies. We, however, were there to see something botanical glow. 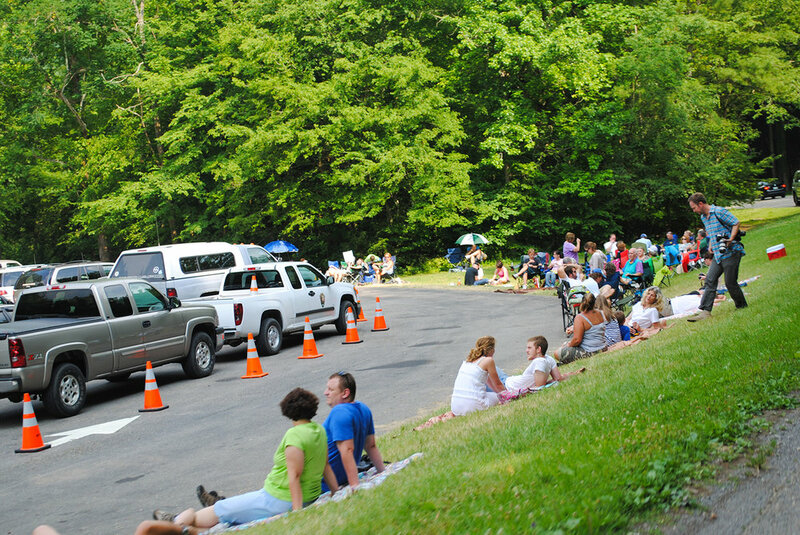 Crowds await travel into the park to see the synchronized fireflies. 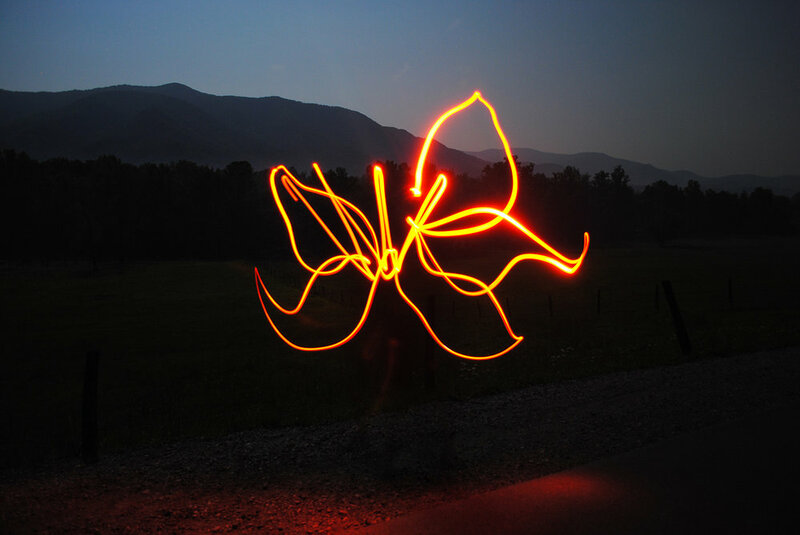 I think seeing the crowds for the lightning bugs inspired us to make some of our own lights in the mountains after dark. 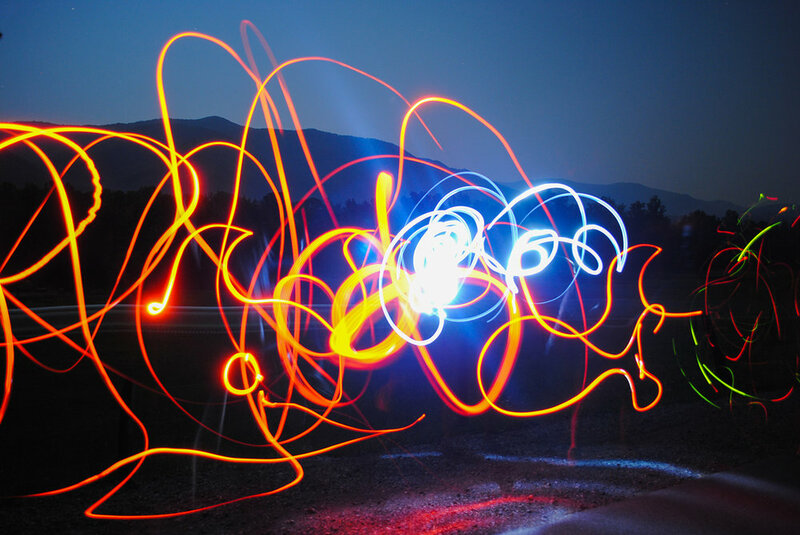 We got several flashlights, I set up the long exposure on my camera, and we started making light art. Light art fascinates me. I need to do more of it. Kevin Parris tried his hand at drawing a Rhododendron flower, and I'd say he succeeded! We woke well before dawn, clamored our campsite into the cars in the dark, and zoomed through Cades Cove in the civil twilight. It cracked me up. Every time I’ve travelled the eleven-mile loop in the past, it was slow going either because you were taking in the scenery from the valley or because you were following someone slow. And, I’m sure for you readers who have ever been can attest that you, too, have sit in traffic while onlookers (or you) pause for deer and bear. But, today our goal wasn’t the fauna in the valley but the flora on the top. A quick pic from the car of the glorious Cades Cove at dawn. We travelled the gravel of Parson Branch Road. At one point in particular I remember being told to not let off of the gas because of the steep incline my Ford Escape had to climb. I recall leaning forward in the needless hope the car wouldn’t topple backwards. We arrived at the trailhead around daybreak ready for a four and a half mile hike to the summit of Gregory Bald. After the hike from the day before, I felt every tenth-mile of the trek. It was beautiful hiking through the forests of Appalachia, and along the way we paused to appreciate the flora from towering Magnolia to verdant seeps inhabited by Veratrum. It seemed we had been walking forever when suddenly the forest broke away and the Rhododendrons appeared. Staring at the orange orbs conjured thoughts of lava erupting from ancient couldrons. WE MADE IT!!! AND, THEY'RE BEAUTIFUL!!! We were a bit weary from our trek to go into full plant geek mode, so we rested and ate lunch before we began our explorations. From our vantage point, we saw the loop in Cades Cove we had just raced through in the pre-dawn light. It was a bit of an out of body experience for me. So many years I’ve circled that road and looked to the surrounding peaks, sometimes stopping to enjoy a picnic with my family. Now, in this shallow heaven, I was looking down and stuffing my face with a sandwich. The light green in the valley below is Cades Cove. After lunch, we began to explore the bald like kids in a candy store with with each plant offering a new flavor of petal color—cherry red, butterscotch yellow, bubblegum pink, and orange... orange. Then, there were other attributes to devour like sweet fragrance, licorice-colored stamens, colorful blotches, early and late flowering, and differing heights. Here’s a few photos to make your mouth water. I loved seeing the loners, little islands of orange surrounded by a sea of grass. Here's a nice close up photo of the flowers of Rhododendron cumberlandense. Another loner. 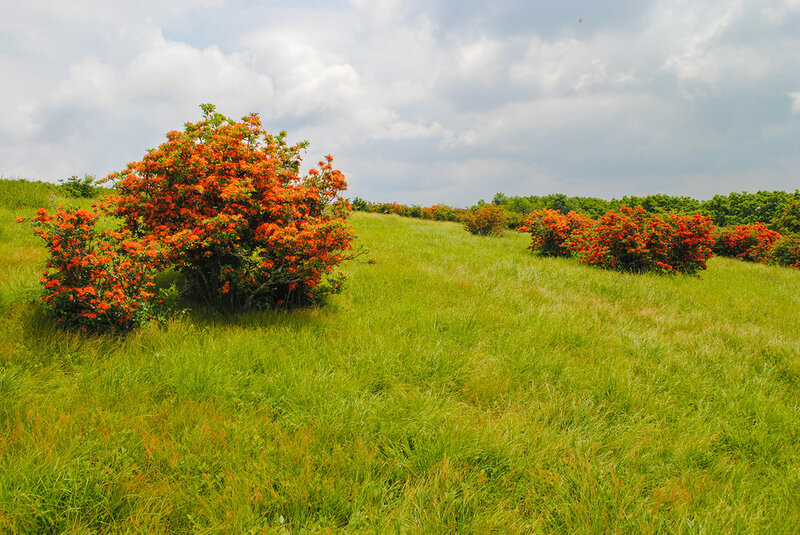 Notice how the softer orange petal color echoed the tan of the surrounding grass panicles. Occasionally, we spotted some plants with galls on them. One plant I found had buds still unopened, and getting up close made me weak in the knees. They look so cool, like little flames licking the sky and waiting to burst into full-flowering conflagration. Pollinators were working these shrubs left and right. I bet that bee on the right is saying, "WHHHHEEEEEEEEEEEEEEEEEEE!" I mean, who doesn't want to slide on some stamens? So, how does this magical place, this garden of Eden even exist? 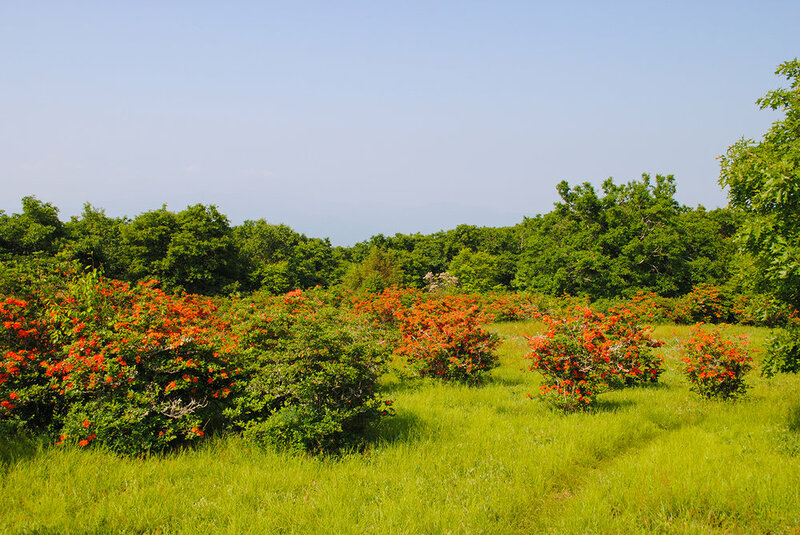 A narrow path leads through the grass matrix surrounding the fiery-colored azaleas. We should first address the absence of the trees that allow for other species to grow and give the balds their name. For many years, the origins and persistence of these fascinating ecosystems have been debated, but the current hypothesis from Weigl and Knowles is that these grass and forb dominated patches originated due to glaciation and were maintained by herbivores. The cold made the the high mountain tops unsuitable for woodies, and during warming periods when plants reclaimed the peaks, herbivores—megafauna and their modern ancestors—topped woody flora with munching and trampling. Similar ecosystems in the Pacific northwest and the Poloninas in Europe support this hypothesis. One end of the bald had more trees and shrubs growing around the azaleas, a step towards succession. Here, blueberries dominate. The bald created a place for the azaleas to grow, but why were there so many azaleas here? 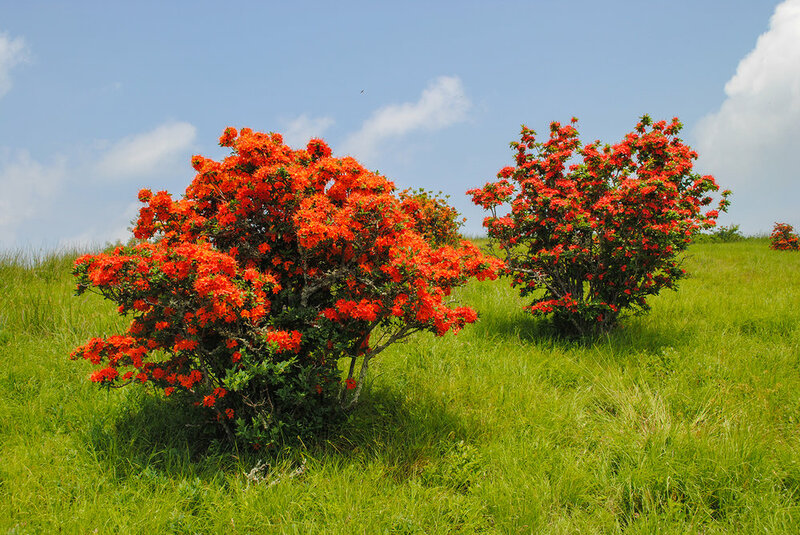 We had only seen a few of the deciduous rhodies on our trek up, and yet here there were hundreds in full bloom. And, not just one color but many variations on the warm hues. 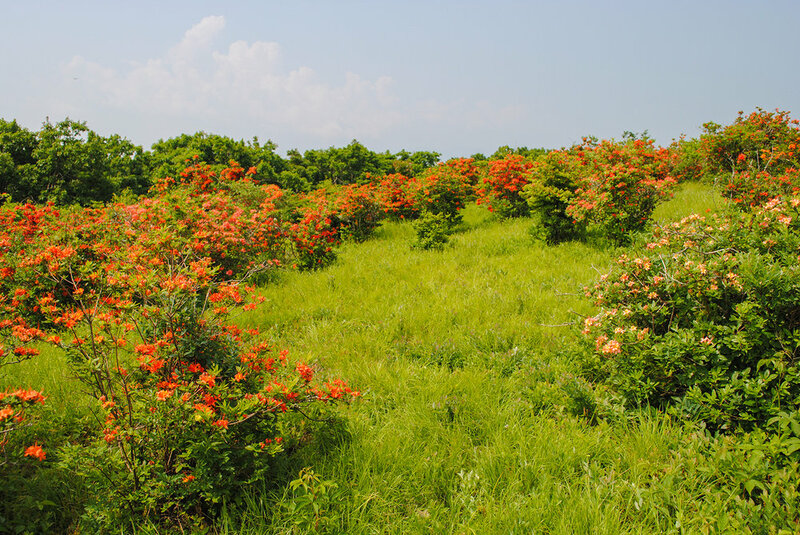 One hypothesis is that the azaleas have climbed by seeding themselves, scaled the mountain with warming temperatures, and hold the last high ground against the advancing forests. Others have made the case that this colorful collection is an example of gardening the wild and that many years ago settlers moved azaleas they adored to the top of the mountains. The shrubs that we see today are relics from this pioneer gardening or those plants' offspring from an earlier time. The silvery foliage of a ground-hugging Salix (or, that's what our best guess was) played as a nice foil to the orange azaleas. Either way that the azaleas arrived on top of Gregory Bald, they form a hybrid swarm. Sinister-sounding, but quite harmless. It is a way of describing how the genetics move in the plant population. Most people think of evolution and the movement of traits between species as a tree. You start at the base and climb upward, and every so often there is a branch where some new trait or species arises. 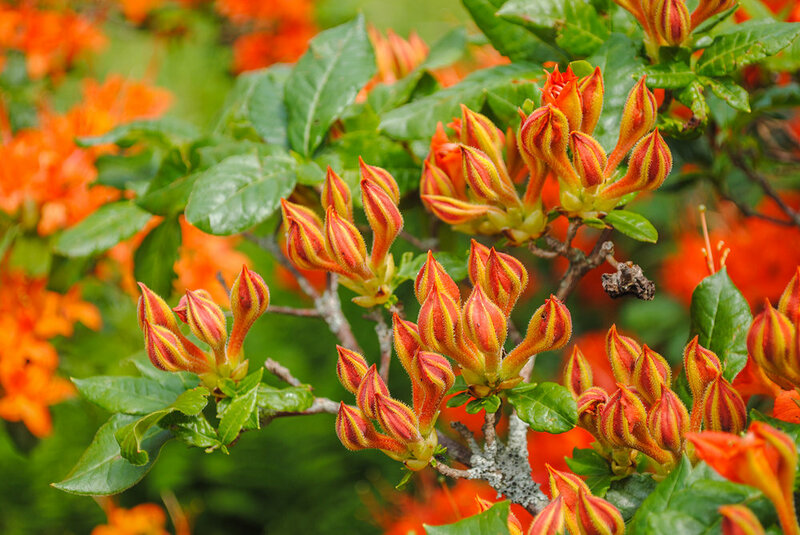 But, for some genera like Rhododendron that readily hybridize, the movement of plant traits is more like those rope jungle gyms that you used played in as a kid. Traits can jump from where there are knots in a rope as long as there is a bridge between them. Kim’s summer internship project focused on better understanding how these bridges might exist. 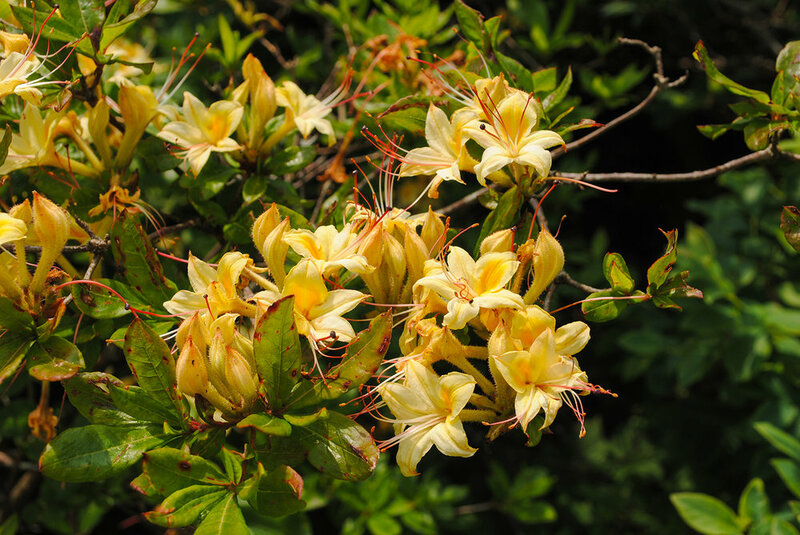 For example, Rhododendron cumberlandense and Rhododendron arborescens (sweet azalea) are separate species that occur on Gregory Bald, and the identification of several plants that show intermediate characteristics helped to support genetic movement between species. If you want to learn more, check out her insightful paper here. 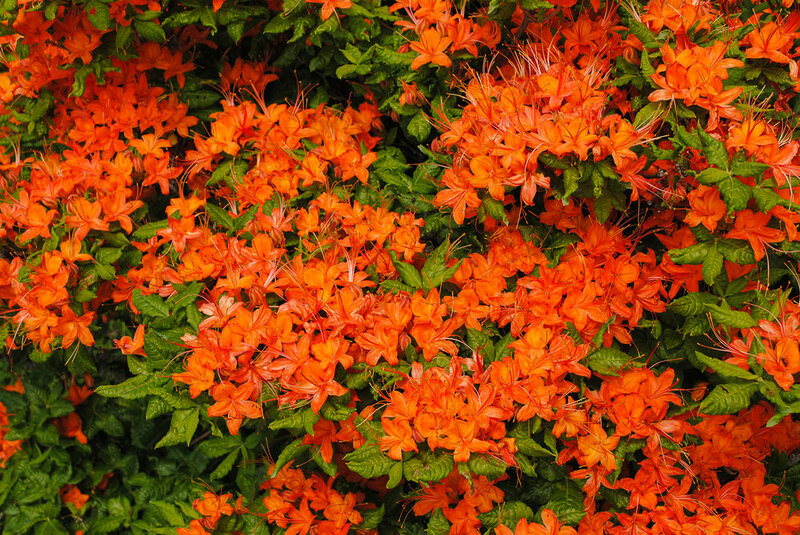 Here's a nice example of an azalea showing intermediate characteristics. 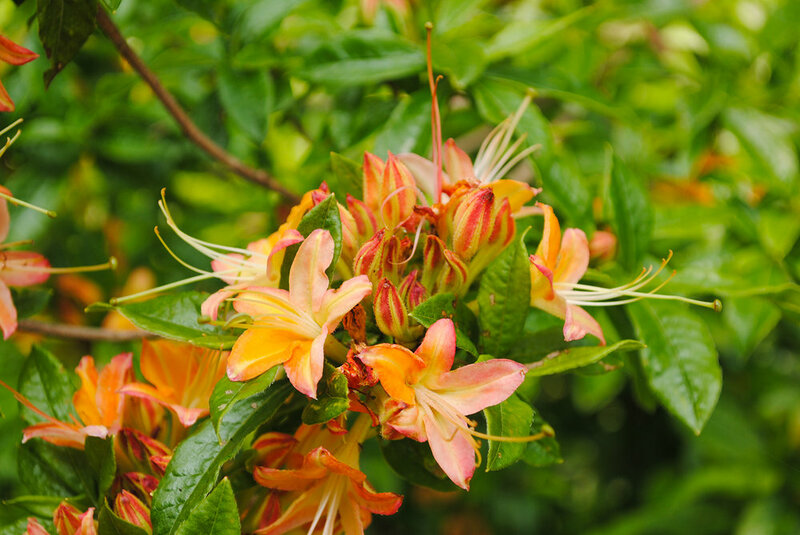 While the exact parentage is unknown, hints of pink from Rhododendron arborescens appear to mingle with the orange from Rhododendron cumberlandense. I unfortunately had to leave the group early as I had a six hour drive ahead of me to get back to Raleigh. It was the experience of a lifetime with good friends, and I want to go back. This scene could all be forest. But, it's not, and that enriches life. And, I hope I can return and see the azaleas and the bald. Researchers believe that if we don’t intervene, the balds will one day become reforested and disappear. On some balds, encroachment from the trees is already a management issue for maintaining these ecosystems. Granted, some might argue that succession towards forest is nature taking its course, but I think it is important to maintain these ecosystems for the diversity of the Appalachians and for people to have these incredible plant experiences that help us appreciate the beautiful web of life and to garner inspiration for our gardens.